In a fitting tribute to the 90th Anniversary, Nikon surpassed the production milestone of over 40 Million Nikkor lenses this month. Although Nikon was producing lenses as early as 1932, it wasn't until 27 years later that the F-mount was introduced alongside the legendary namesake camera model. In a testament to the popularity and stability of the engineering, lenses from that time will still mount and function (within limits) on all Nikon cameras, including the latest digital variants. We look forward to the next 40 Million and eagerly anticipate the latest developments as Nikon creates the next generation of optics. Nikon has established a Scholarship Program in Thailand, rewarding 170 students from all levels of high school and university level classes by helping defray their educational costs. The corporate giving is seen as a way of giving back to the hard-working community that produces nearly three-quarters of it's hot-selling Digital Imaging products, mostly built in the Ayutthaya province plant, which was established in 1990. Nikonians Academy Director Mike Hagen begins a new series of weekly blog updates with an overview of popular course offerings. He explains how you can learn to become a better creative photographer in a special two-day workshop and how to achieve professional printing results from your ink jet printer. He also provides us with a peek at the upcoming workshop schedule. Are you struggling to learn how to become a better creative photographer? Based on feedback and popular demand, we have created a new workshop titled "Master Your Photography" that is squarely aimed at helping you create works of art. This two day workshop is being led by our own Darryll Schiff who is a professional Fine Art photographer. He has spent many years in the photo industry taking celebrity shots as well as doing commercial work. This two-day workshop mixes classroom instruction with location and field photography. We spend a significant portion of time each day taking photos and then returning to the classroom to download, debrief and critique our images. Darryll shares his wisdom and knowledge by working with you to understand composition, design and the Art of Seeing. Join your fellow Nikonians on this great workshop and learn how to use your Nikon Cameras in the field like a pro! Also by popular demand, we have created a new workshop called "Master Digital Printing." This is aimed at helping you achieve professional printing results from your ink jet printers. We cover detailed topics such as profiles, printers, Photoshop setups, RAW conversion, color management, uprezzing and soft proofing. Darryll Schiff is a master printer and knows his stuff. Come along to learn from a true professional. Stay tuned next week for an announcement about new workshops in Philadelphia this October. Our weekend gallery maintenance has been completed and members will now find additional useful features. Album management will now be easier, and the gallery space quota for members has been increased. The new space quota is now 50MB for Silver members, 200MB for Gold and 1000MB for Platinum. The additional features were made possible once the galleries began running on our new powerful servers. Tune in for the weekly update from the Nikonians Community, including Nikonians Academy news, information from Sigma and more! Check out the latest from The Nikonians Academy. Winners of the 2007 Nikon Photo Contest International. Sigma's new lenses for the Nikon-mount! The "Best Submissions" for June's Online Photo Assignment, Detail. Other Camera Systems & Formats. Due to technical issues, we are extending the maintenance period of the www.nikonians-images.com galleries. We expect the galleries to be fully available this Sunday July 29th 08:00h CET+1 (02:00 AM ESTD). Sigma continues expanding their Hypersonic-Motor (HSM) equipped line of lenses with revised models of the popular 18-50mm f2.8 DC Macro and the 17-70mm f2.8-4.5 DC Macro specifically for the Nikon mount. The community sends a hearty and jolly Happy Birthday to Nikon! Our favorite camera brand is 90 years old - here's to many more anniversaries! The winner of the 2007 Nikon Photo Contest International is Tung Khan Le from Vietnam for his stunning black-and-white study of two fishermen struggling against an angry sea while affecting a rescue. See Khan Le's dramatic shot and all of the other winners online. G o behind the lens with landscape and nature photographer Ross Hoddinott. Our UK reporter, Brian Tilley, spent some time with Ross delving into his photographic habits and techniques. Click here to download Nikonians Podcast #8 (NPC-2007-07-25.mp3; 37;34; 13.1MB, MP3 format). [iTunes] Subscribe to the Nikonians Podcast directly in iTunes. [RSS] Add the Nikonians Podcast feed to your RSS aggregator and have the show delivered automatically to you. We expect that the galleries will be available again Friday July 27th 2007 08:00h CET+1 (02:00 AM ESTD) latest. Our official community address is www.nikonians.org. We have many other domains as well, but make sure you are using nikonians.org. We are in the process of migrating parts of the community to new servers, so other domain names may not work as expected. You can master your Nikon D200 by attending our Nikonians Academy D200 Workshop August 9 in Toronto. The course is open to all Nikonians members. Full details are available in our new registration section of the Nikonians Academy. Instructor Winston C. Hall is a professional photographer, speaker / facilitator and business owner living in the Pacific Northwest where he pursues his passion of helping people express themselves creatively through his technical and non-technical photography workshops and coaching services. The Toronto course is one of four one day workshops scheduled between August 9 and August 12. Courses also available include Master your Nikon D80, D70, D70s, Master Nikon Capture NX and Master Nikon i-TTL Flash. 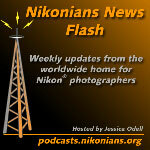 The July 21 addition of News Flash brings you updates from the Nikonians Academy, Nikon news and information about NFL regulations and the BBC's Photographer of the Year contest. The Nikonians Academy is pleased to announce our newest instructor, Carmine Picarello! The Nikon School announces new DVDs aimed at DSLR owners. Be wary before installing firmware updates for the P1/P2 and S6 CoolPix cameras! Please read about the updates first! NFL rules for photographers include a bright red vest! BBC cancels their Photographer of the Year contest. Glamour & Portrait, Commercial & Studio. Email Jessica at newsflash@nikonians. org, or drop us a line in the Podcast Feedback forum! In a sign of continuing pressure for ethics revamp amongst the media industry, the BBC has cancelled all phone-in, interactive and online competitions following a series of "editorial breaches." This includes the prestigious BBC Photographer of the Year contest. Members of the BBC organization were found to have faked contributions, including making calls to phone-ins under false identities and editing footage that changed the true context of events. Nikon has pushed out firmware updates for the P1/P2 and S6 Coolpix models. Members should exercise caution though; the P1 and P2 updates enable Wireless Utility support for Windows Vista at the expense of XP and Mac OS. Similarly, the update for the S6 enables wireless utility support for Windows Vista and Intel Mac, but not for other Windows versions or Macs that are PowerPC enabled. Bizarre? You bet. Recently enacted rules by the U.S. National Football League (NFL) regulating media practices have industry members up in arms. One of the pernicious points: authorized photographers on the sidelines of games must wear a bright-red NFL identification vest that has a large logos of Canon and Reebok. A new site for fine art photography just opened its doors today. www.FineArtTv.tv is a new online magazine and internet TV station dedicated to the world of fine art images. The site will provide weekly updates on modern, artistic trends with articles, portfolios and videos. One of the team members and initiators of the site is Nikonian Pascal Baetens. Congrats Pascal, way to go! Jason and Rick discuss their photo shoot atop Colorado's Mount Evans, where they had the opportunity to do some high-altitude shooting. Also in this episode: All about the image histogram, how to perform highlight recovery, and the weekly photo prescription. A recent Reuters article indicates the EU is preparing to reclassify certain digital cameras into high tariff categories normally reserved for video cameras. Most digital stills cameras (DSCs) will likely be exempt. The intended target is very high-end - the camera must be able to sustain 800x600 at 23fps for 30 minutes, a performance which most consumer DSCs are unlikely to match. To be near you, the Nikonians Academy continues its workshops expansion and is pleased to announce the addition of Nikonian pro Carmine Picarello as new member of the faculty. 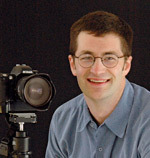 With decades of shooting experience, Carmine Picarello is one of Connecticut's most highly regarded commercial photographers. He is known for his stress-free style, dramatic lighting, vibrant colors, and engaging, results-oriented photographic images. He creates photos with creative flair. Photos that make an impact. In addition to shooting commercial work for clients such as Dymo Corp., Minwax, Danbury Mint, Quisinart and GE, Carmine has a successful portrait and wedding business that is in high demand. Carmine is also well known for his excellent teaching skills. He has been teaching college level photography courses for years and regularly develops new curriculum as new technologies come to market. Carmine has thorough understanding of digital workflow, lighting, camera technology and photographic composition. He is friendly, helpful and a fantastic workshop instructor! You can see some of Carmine's work here. The Nikonians Academy is proud to have him as a member of the faculty. This week, Jessica brings you the latest from Nikon, including UK warranty information. Metz and Flaghead introduce new flash products, and DxO has a new upgrade! All this...and more! Nikon UK extends warranty to 2 years! Nikon and Kaboose, Inc partner to launch Kaboose Photo. Find out more here. Metz and Flaghead's new flash products! DxO's Optics Pro upgrade to version 4.5. Roberts Imaging's photography experience at the 2007 Indianapolis Airshow. Great news for our members in the UK - the Nikon subsidiary there has extended the warranty for digital camera products from the global one-year period to an amazing two years. The warranty offer will start on 01-September-2007 and will apply to the whole spectrum of digital camera models, from Coolpix compacts to the latest Digital SLRs. The offer will also be extended retroactively to purchases of qualifying products made on or after 01-July-2007. No information was available as to whether the offer will be extended further back than July. Let's hope this wave of confidence in build quality makes it to other sales regions soon. Nikonians who have bough it hail it as a great camera if compactness, speed, and VR are on your priority list. The flash is even better than most in it's class. Our colleagues at LetsGoDigital have posted their review of the Nikon Coolpix S500. Whoever is looking for an excellent performing compact camera and who has no ambitions to use the camera for extensive digital photographing, will find an ultimately decent camera in the Nikon S500. Newsline International reports that a recent Japanese domestic market survey in PEN News Weekly shows that Nikon has displaced Canon as the DSLR market leader and has held that position for the past 6 months, thanks mostly to brisk sales of the D80 model and the recent introductions of the D40 and the D40X. As always, it's a free upgrade for all DxO Optics Pro v4.x users. Macro and close-up shooters hankering for a ring-flash but have a limited budget may want to consider this adapter from Flaghead. The unique design reflects the light from a standard hot-shoe external flash, routing it down a series of mirrors and prisms and exiting in a ring-light centered around the lens. Not so good news, it's only available in the UK. Perhaps we'll see it being offered overseas soon. Popular third-party flash maker Metz has introduced a new model designed specifically for Nikon and Canon digital SLRs. The Mecablitz 58 AF-1 digital distinguishes itself from the crowd with a unique USB interface to allow easy firmware upgrades and a unique secondary reflector to enhance fill effects even during bounce operation. The flash is very comparable to OEM offerings, with features such as a built-in bounce card, a very powerful GN of 58 (ISO 100), coverage from 18mm to 105mm and full compatibility with with i-TTL and D-TTL camera models. Roberts Imaging is offering a unique photography experience; for 75 USD, shutterbugs will be granted admission to the 2007 Indianapolis Airshow on August 26th featuring the US Navy's Blue Angels jet demonstration team, along with exclusive benefits. The cost will also include exclusive access to the Roberts Imaging Chalet located on the flightline, a catered lunch and access to Nikon, Canon and Bogen equipment onsite for use during the show. Representatives from all three companies will be on hand to lend expertise. Seating is limited, so those who have a hankering to try out the latest long lenses with VR or IS should sign up quickly. Nikon has partnered with the largest family-focused media company online to launch Kaboose Photo. The photo site, expected to go live July of this year, will feature Nikon as the preferred source for digital photography products and will reach a wide family-centric audience. Tune in for information on the latest Adobe Lightroom update, a recent burglary at Sigma's UK offices, 2007 Podcast Award nominations, and the latest from the forums. Also, hear about a listener's recent experience in Kildare, Ireland! Trouble with Adobe Lightroom 1.1 updates? Check out our Post-processing Forum for more information. Sigma UK Burglary! Get the serial number list here and call 01707 329 999 to report any suspicious transactions! Check out LetsGoDigital's report on the Nikon CoolPix S500! FInd out about how to nominate us for the 2007 Podcast Awards! July's Online Photo Assignment: Silhouette. Calling all Nikonians in Montreal! CONTEST! Listen in to win! A brief entry in the 05-July edition of the Bangkok Post reveals that Nikon is planning to expand manufacturing capacity to meet the world-wide growing demand for digital cameras. An official with Thailand's Board of Investment confirms that the Japanese camera maker will invest 519MM Baht (about USD15MM) to expand the factory in Rojana Industrial Park. Formerly a source of film cameras, the location now produces popular digital SLR models and lenses. The move will include hiring up to 5000 workers to ramp up production. LetsGoDigital: Nikon S500 at Arches N.P. Our colleagues at LetsGoDigital have been putting the Nikon Coolpix S500 through it's paces in a recent visit to picturesque Arches National Park in the United States. This week, hear about Jason and Rick's brief encounter with the Fuji FinePix S5 DSLR, and then learn about how exposure modes work on your Nikon. Sigma UK recently revealed that their offices had been broken into and a significant number of lenses, flashes and tele-converters had been stolen. The serial numbers are available and the list is extremely extensive - seven pages long. The company requests that the public be on the lookout for Sigma inventory that might be priced unusually low and to contact them at 01707 329 999 for any suspicious transactions. Join the discussion in our Postprocessing Forum regarding the latest bugs in the Lightroom 1.1 update. Now after talking with Adobe this morning, they clearly stated that they are aware of a catalog corruption issue, and that this issue is more severe with customers who have started using LR from a beta version. That also stated that because getting a corrupted catalog during an update was not repeatable, that (the directors) chose to NOT release this information! Nikonians wishes all of our US members a Happy Independence Day! And if you're going out to enjoy the fireworks, why not bring your camera? Be sure to check out our popular How to Photograph Fireworks article by Lyle Stavast. Scheduled maintenance on the Nikonians Servers will take portions of our member services offline for a short time on Monday evening Eastern Standard Time. Specifically, our galleries and our Photo Pro Shop will be sporadically unavailable between 6 PM and 12 PM EST today, July 2nd, and possibly for one or two more evenings. Please check our News Blog for updates.